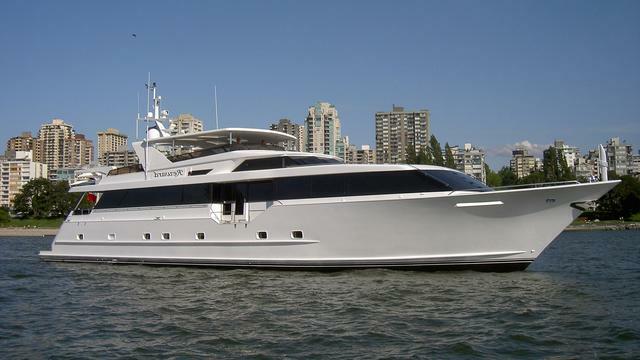 RJC Yacht Sales & Charter announces the sale of 103' Broward, REWARD! RJC Yacht Sales is pleased to announce the sale of the 103' 1998 Broward, REWARD. She was listed for sale by Bob Cury at RJC Yachts. REWARD was delivered in 1998 and has had several refits, most recently in 2014. Her wide body configuration extends forward of the wheelhouse and creates an enormous country kitchen dining area suitable for large numbers of dinner guests. She accommodates eight guests in four private cabins all with en suite bathrooms, televisions and DVD systems, and up to four crew aft. Guest accommodation consists of a master suite with a king size bed, a VIP suite with a queen size bed, a starboard double and a port twin cabin. In the main salon are comfortable sofas, six occasional chairs in maple, a remotely controlled coffee table that converts to an alternative dining table and an entertainment centre including a satellite television screen. Outdoors, an expansive aft deck has easily enough space to seat eight guests for al fresco entertaining and dining. Reward has a vast flybridge designed specifically for lounging and entertaining and includes a barbecue area, wet bar, 18 foot Zodiac tender and a custom hard top. Her custom interior in mahogany was tastefully updated by a knowledgeable owner and additional upgrades include new Awlgrip paint in 2014, new teak decks and a major overhaul of her engines. The engines, twin 1,100hp Detroit Diesels, give her a cruising speed of 14.5 knots. Lying in Vancouver, British Columbia, REWARD was asking $1,995,000.